Do you have a small, medium, or even a very large office? If so we can definitely help you clear out whatever need be. 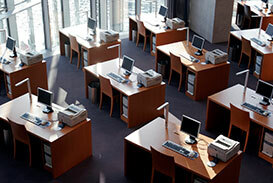 If you are moving offices and need to be out at a certain time, we can accommodate you! Office cubicles, office chairs, papers, printers, tv’s, any electronics, carpet, water dispensers, whatever you can think of we take, the only thing that we don’t take are chemicals like printer ink, paint, etc.